This topic describes a general approach to running ReadyAPI tests from Jenkins. We need to create a Jenkins job that will run ReadyAPI tests from Jenkins slave machines (or Jenkins nodes). 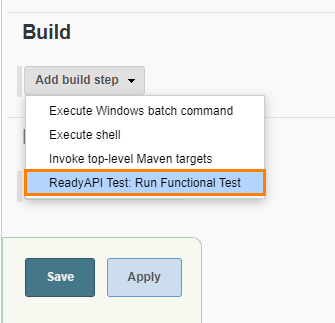 To run ReadyAPI tests, you need to install ReadyAPI on each Jenkins node and use the SoapUI Pro Functional Testing plugin or ReadyAPI command-line runners to run the tests. 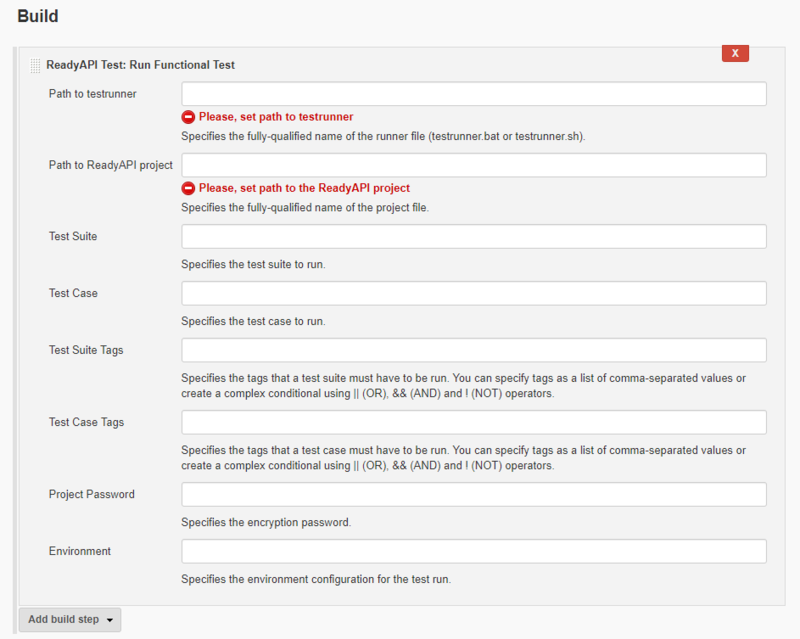 The SoapUI Pro Functional Testing plugin provides you with an easy way to run functional tests from Jenkins. If you need to run load or secure tests, or if you need to specify advanced options for a functional test run, use the command-line runners. Note: To deploy, start, stop or update virtual services on VirtServer, use the Jenkins VirtServer plugin. In order to run ReadyAPI tests, you need to activate the appropriate license on each node. The easiest way to do this is to install ReadyAPI on a node and activate the license through the ReadyAPI user interface. However, it is considered to be a good practice to clean up the test environment after the test run is over. In other words, you may want to configure nodes automatically before each run, and this means you may want to automate the ReadyAPI license activation. ReadyAPI supports a special command-line tool to automate activation (see below). Which license to use: Floating or Fixed? It is reasonable to select a Floating license as it suites dynamic testing environments in a better way. You will activate the license on some computer in your network (let’s call it license server) and configure ReadyAPI instances on Jenkins nodes to connect to this server and to check out the license from it. One of the supported Java versions installed. Network access to the license server with the Floating license activated (by default, the server works on port 1099). Access to the ReadyAPI License Manager .jar file. You can download it in the .zip format from our website. Extract the .jar file from the downloaded .zip archive and copy it to your Jenkins node or put to a shared network folder, to which the node has access. Access to the ReadyAPI installation program (you can copy it to your Jenkins nodes, or you can put it to a shared network folder). On Windows Jenkins nodes, disable the User Account Control (UAC). You can do this in the Control Panel. Otherwise, Windows can display various system confirmation dialogs, which require user interaction. On the Available page, type SoapUI in the Filter field and select SoapUI Pro Functional Testing Plugin. Tip: We recommend using Java Web Start for launching nodes in most scenarios. The optimal method depends on your environment. Windows Jenkins nodes: select Add build step > Execute Windows batch command. Linux or Mac nodes: select Add build step > Execute shell. Configure the step to run the ReadyAPI installer. Add the -q argument to the installer command line. This way, the installation will run in silent mode, that is, without any user interaction, and will use the default values for all options. To change the installation folder, you can use the -dir argument. -varfile lets you specify additional installation parameters. You can find more information in the install4j documentation. Tip: If you use the SoapUI Functional Testing plugin, specify 1. Here, MyCode.txt is the file that contains the code of the licensed ReadyAPI application (see above). To run ReadyAPI tests from a Jenkins node, you need to copy your ReadyAPI project to this node. You also need to copy the data files your tests use. To copy the files, use the Jenkins Copy file build step. A possible alternative is to place the project and data file to some shared network folder to which Jenkins nodes have access. Make sure the SoapUI Functional Testing plugin is installed. 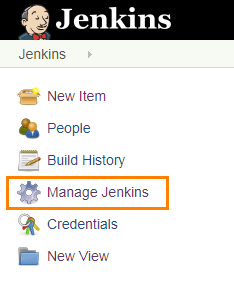 In Jenkins, select a job and click Configure. Path to TestRunner Specifies the fully-qualified path to the test runner binary (testrunner.bat or testrunner.sh). By default, you can find it in the <ReadyAPI installation>/bin directory. Path to SoapUI Pro project Specifies the fully-qualified path to the SoapUI project you want to run. Test Suite Specifies the test suite to run. To run all the test suites of your project, leave the field blank. Test Case Specifies the test case to run. If you leave the field blank, the runner will execute all the test cases of the specified test suite, or, if you have not specified a test suite, all the test cases of your project. Project Password Specifies the encryption password, if you encrypted the entire project or some of its custom properties. See Protecting Sensitive Data. Environment Specifies the environment configuration for the test run. It is impossible to specify additional arguments for the test runner the plugin activates. If you want to do that, call the test runner using the command line – see above. If you use the SoapUI Pro Functional Testing plugin, the SoapUI test runner exports a JUnit-style HTML report to your Jenkins workspace directory. TestRunner – Runs SoapUI functional tests. Security TestRunner – Runs security tests created in ReadyAPISecure. LoadUI TestRunner – Runs load tests created with LoadUI. VirtRunner – Starts or stops a virtual API created with ServiceV. To run any of these tools, add an Execute batch command step to your Jenkins job. As we wrote above, the way you do this depends on the operating system of your Jenkins node. "c:\readyapi-folder\bin\testrunner.bat" "-sTest Suite 1" -cSimpleRequest "-RTestCase Report" "-EDefault environment" "c:\work\projects\my-project.xml"
For complete information on the command-line arguments, follow the links above. By default, Jenkins runs jobs by using its own user profile. In this case, if you use a Fixed license, ReadyAPI will not be able to find it. To learn how to fix this issue, see Jenkins: "License Not Found" Issue.